1. A few months ago, I made a quesadilla recipe from one of my favorite food blogs, 101 Cookbooks by Heidi Swanson. Read the original recipe and you’ll see that this quesadilla isn’t at all about cheese. It’s unique and the flavors are stunning together. 2. At the Union Square farmer’s market on Saturday, looking for something simple to bring to a friend’s birthday picnic, we picked up a loaf of organic sourdough peasant bread and a nice chunk of manchego cheese. Then, mostly just hunting for samples, we stopped by a table full of jams called Beth’s Farm Kitchen. I was not expecting the variety we encountered – jalapeño jam, blazing tomato chutney, rhubarb, chili cranberry, garlic rosemary jelly… we probably would have tried all 40-ish flavors had we not felt like total pigs. 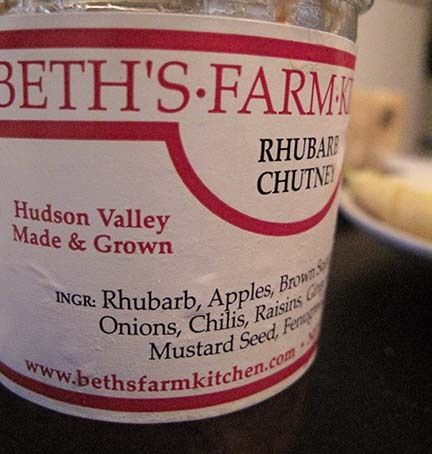 I walked away with a jar of rhubarb chutney (I feel like you have to buy something if you eat samples for over ten minutes) and a frequent jam punch card – believe me, I’ll be back! 3. 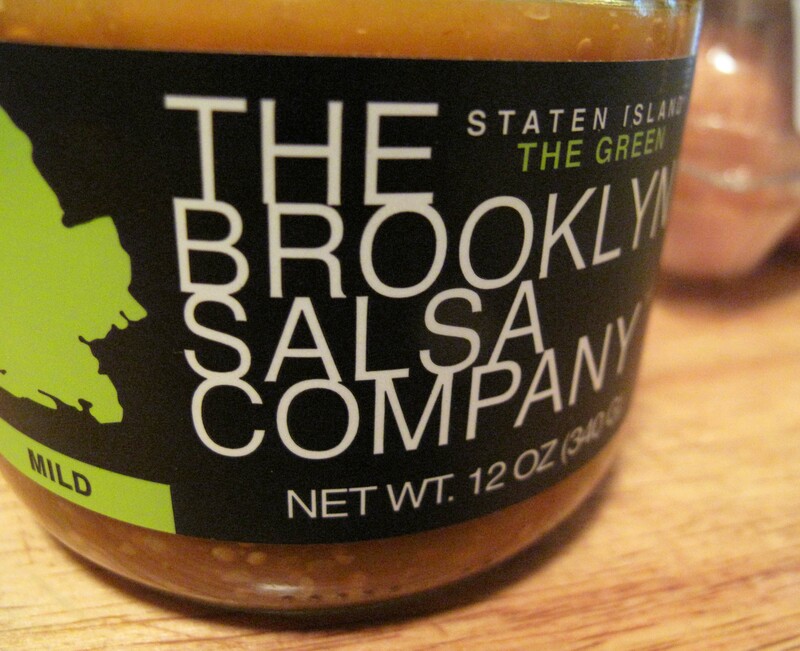 Last fall, I discovered Brooklyn Salsa, probably one of the best salsas I’ve ever had, made with fresh local organic ingredients, at the Brooklyn Flea in Ft. Greene. It comes in five flavors, one for each borough. Having only bought it at the Flea, I was ecstatic to see it on the shelves of my supermarket around the corner a few days ago! When I mentioned it to Chris, he said we should recreate one of our great brunches from last September – scrambled eggs with heirloom tomatoes, roasted red peppers, hot peppers, avocado, lime, and the “Bronx” (curry eggplant) Brooklyn Salsa. However, heirloom tomatoes aren’t quite out there yet (well, there were some tiny ones at the market for $4.75 a pound!) and I was up for trying something a little different. So now that you have the back story, here’s the brunch. 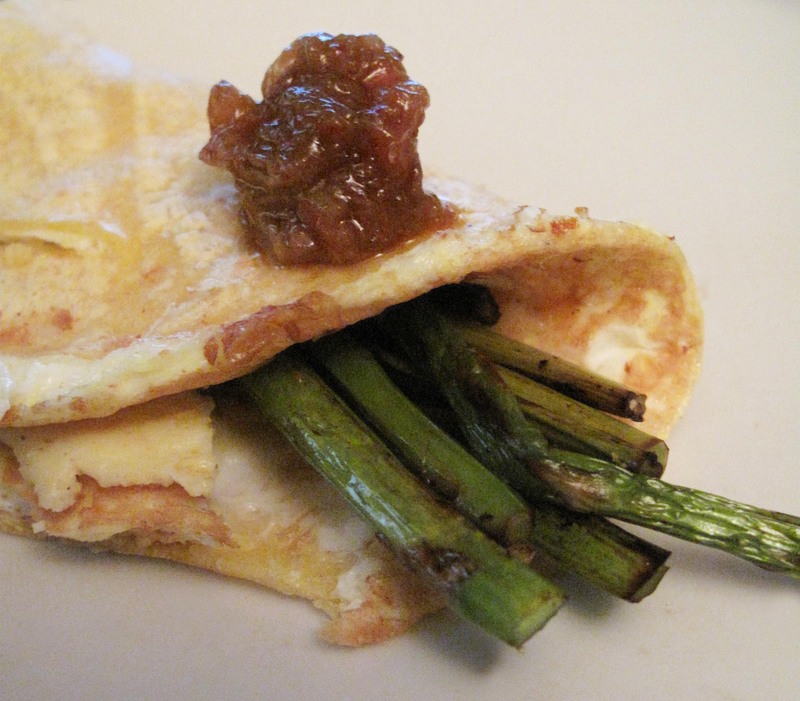 We took the egg-tortilla method from the 101 cookbooks recipe, threw in some grilled asparagus, and thin shavings of leftover manchego cheese from the picnic, and served them with both Brooklyn Salsa (the Staten Island “Green” kind) and the rhubarb chutney. Beat three eggs well (I use Pete’s cage free organic large) and set aside. 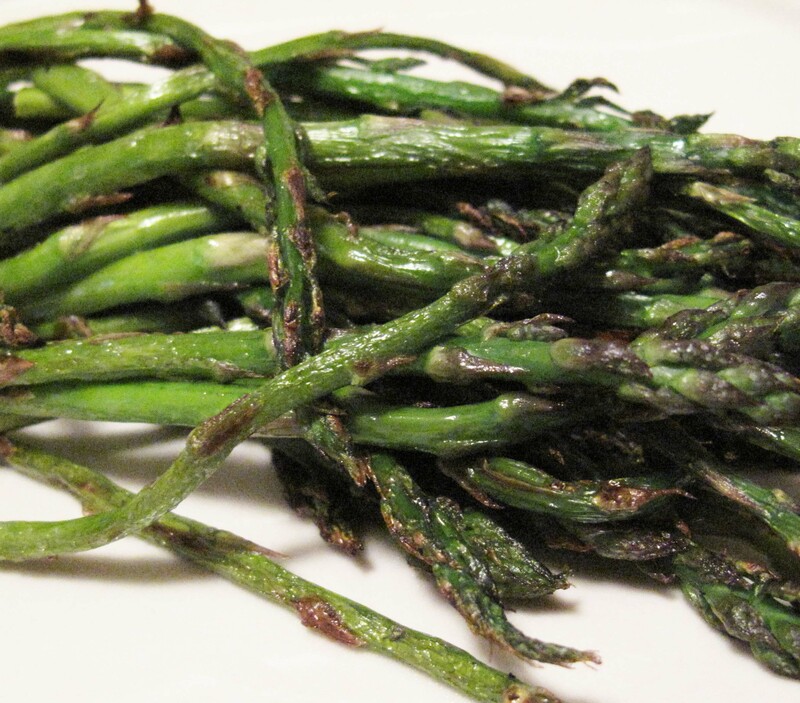 Wash a large handful of asparagus and trim them (just snap the bottoms – they will break where they are meant to). I like to use the skinny variety of asparagus for a recipe like this. Heat a cast iron grill pan and spray it with a light coating of olive oil. Grill the asparagus until just slightly browned and charred. Remove from the grill and set aside. Heat a small pan and spray with olive oil. Pour in about a quarter of the beaten egg and after about one minute, place a small yellow corn tortilla on top and press down gently with a spatula to help it adhere. 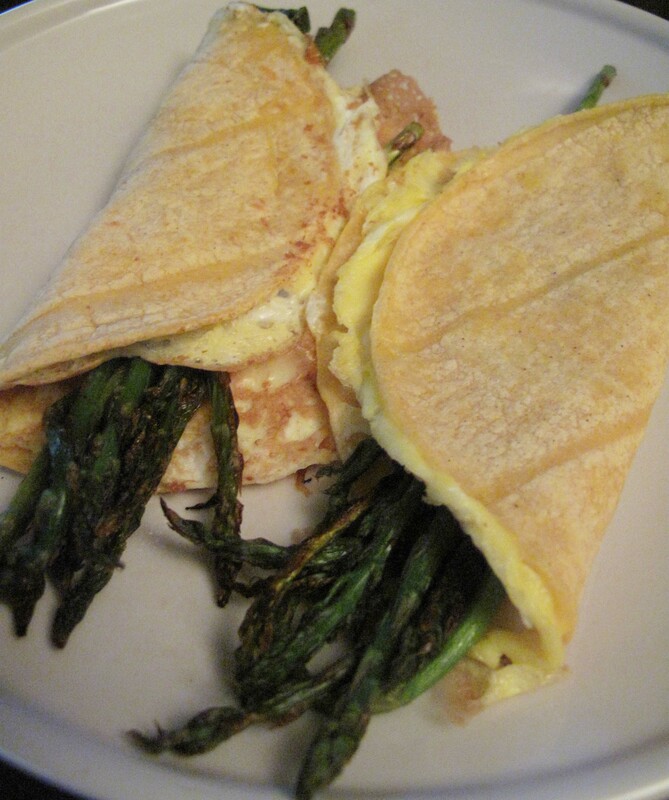 When the egg is set, flip it over and place asparagus in the middle. 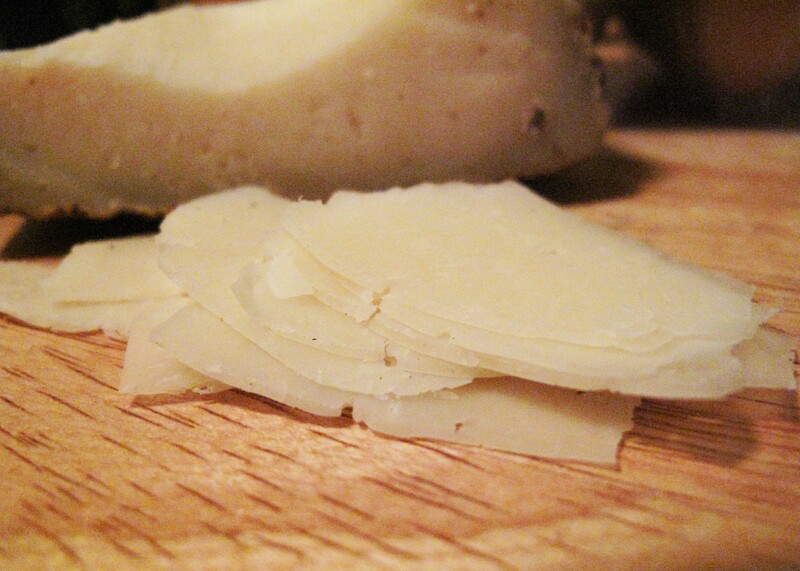 Shave some manchego cheese (as much as you like; I use just a basic vegetable peeler for this) over the asparagus and flip one side of the tortilla over like an omelette. Give it a minute for the cheese to melt, remove from the pan, repeat steps for the remaining three quesadillas, and serve! Don’t forget to add your favorite salsa or chutney. Our verdict? The rhubarb won this round. This entry was posted in Cooking adventures and tagged breakfast, farmer's market, vegetarian. Bookmark the permalink.